Hydrogen yield, in 350ml cylinder (BPA-free): approx. 150 ppb (parts per billion) resp. 0.15 ppm (parts per million) per minute, e.g. approx. 1.5 ppm H2 content after 10 min. Not to be confused with the typical HRW generators which do not use diaphragms and do not operate under pressure. Scope of delivery. Shaped glass flask with pressure valve lid and normal pressure-resistant lid, adapter for plastic bottles and glass bottles, 500 grams citric acid. 2 years warranty, thereafter, if there is a defect, spare parts can be reordered or repaired by us. 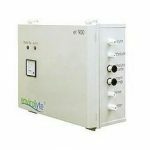 Product information "AquaVolta® Hydrogen Booster | PEM Water Ionizer | Electric Water Ionizer"
For many years it was irrefutable that activated water keeps its negative redox potential and therefor its electron abundance for just a few hours or days. Yet when it was discovered that dissolved hydrogen is the deciding factor for the antioxidant effect was an industry developed that presses hydrogen under high pressure into multilayered water bags, where the positive qualities were able to be kept for some months. 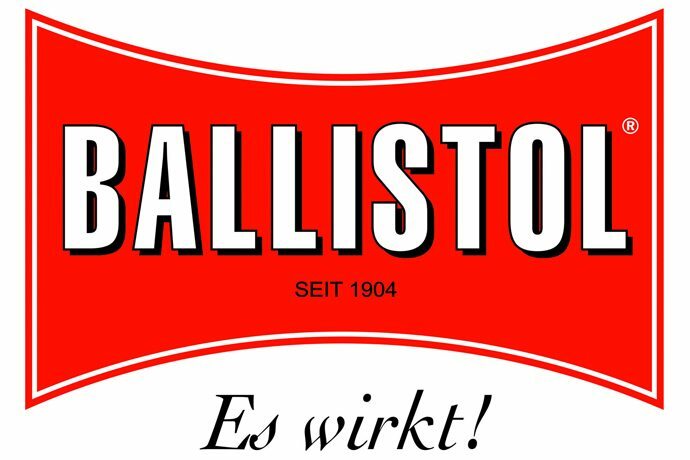 Such a bag with 0,2 l of hydrogen water costs around 4 € and also creates big waste problems. 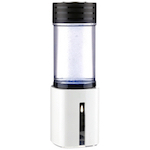 The AquaVolta® Hydrogen Booster is ideal for producing hydrogen rich water when on the move. Hydrogen production in the newly built electrolysis cell makes it possible to renounce acidic waste water. A small amount of condensation is formed which can be easily removed after five or six uses. The production speed for a making a glass hydrogen water (0,2 Liter) is five minutes. It is also possible to ionize 1,5 Liters bottled water directly in an opened bottle of water. Depending on the bottle size this takes seven to twenty minutes. 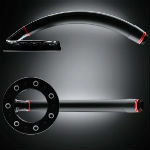 The high pressure resistant system allows a one up to four times over saturation of hydrogen. 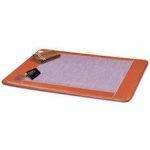 Stationery ionizers usually reach a maximum full saturation of 1,6 ppm hydrogen. What is a hydrogen-booster – an HRW generator? 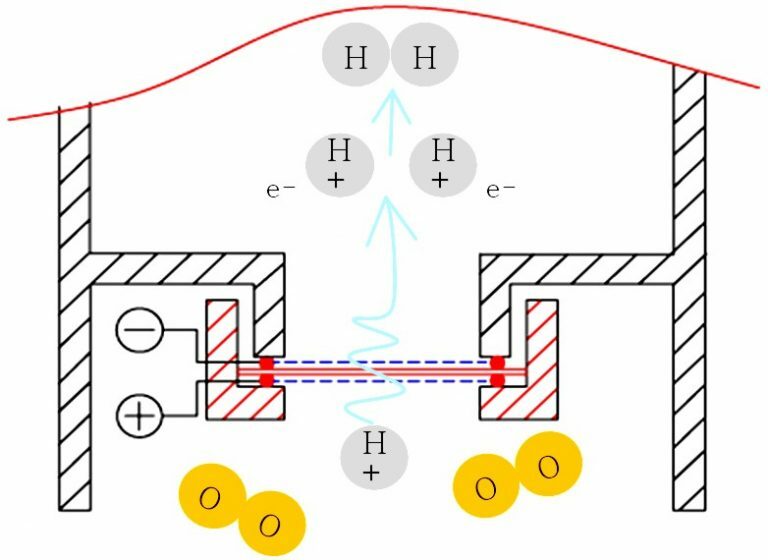 Hydrogen rich water was until now only produced by stationary electric water ionizers. But one does also want to drink fresh activated water when on the go. Initially just small electrolysis devices were converted to battery power. These, however, were not able to store enough because they did not remove the oxygen, instead increased it. Hydrogen rich water. Sadly it is not also alkaline, like from a water ionizer. 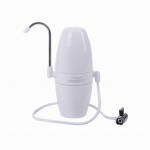 Whilst the hydrogen water bag can be filled with 2,8 ppm hydrogen content, can the AquaVolta® Hydrogen Booster reach up to 6,1 ppm. 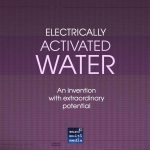 With a device for on the move it is clear: There is no point enriching water with hydrogen energy if it does not make challenging demands on drinking water. 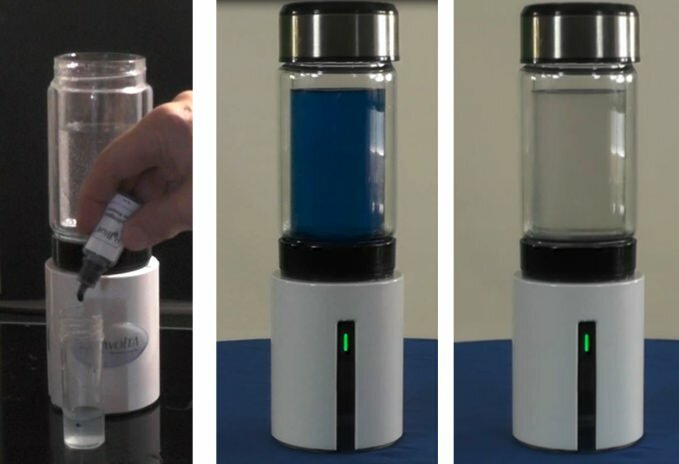 Therefor we have designed the AquaVolta® Hydrogen Booster in such a way that, unlike a stationary water ionizer, it is not limited to one type of water. If you do not trust the available tap water, you can use all trustworthy bottled water and even water from a reverse osmosis device (RO water). 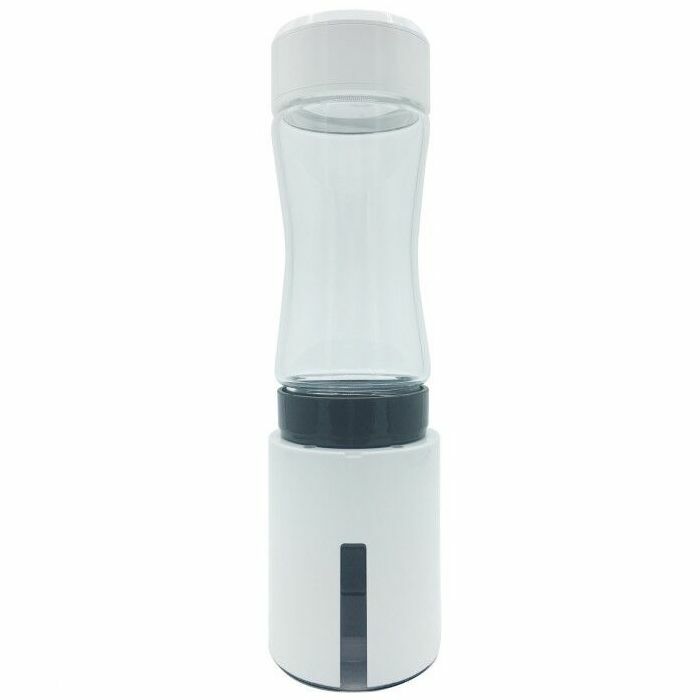 You can fill the normal or the large high pressure, double walled cylinder, included in the package, with mineral water. 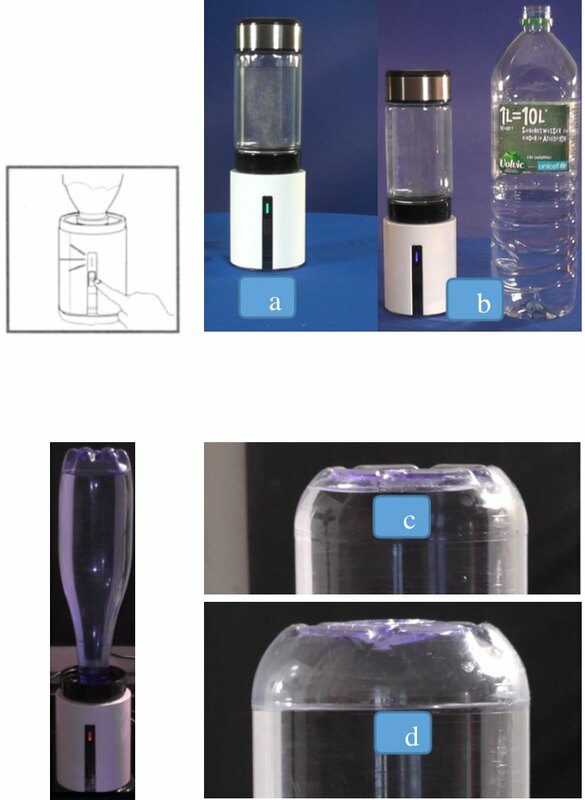 Thanks to various bottle adapters can the water be ionized directly in the bottle and enriched with hydrogen. The water cannot be carbonated. The total gas pressure would rise too greatly. 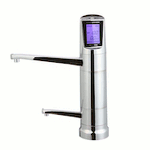 Previously only the ORP was measured, to determine the antioxidant effect of activated water. Yet this is very inaccurate and a relative value, because the ORP is influenced not only by the dissolved hydrogen, but also from the different ORPs of the different materials dissolved in the water, e.g. minerals. After the role of hydrogen was recognised as being important, Japan produced the first pseudo-measuring-device on the market. The Trustlex ENH 1000, which wanted to differentiate a content of dissolved hydrogen with the measured ORP over an experience based conversion factor of ca. (-)2,14. This factor was severely criticised by experts in Japan and the U.S. and Trustlex has admitted that the device does not work properly. One drop of the H2 Blue Kit ® is internationally valid as evidence for 100 ppb (0,1 ppm) dissolved hydrogen in water. In the picture (centre) you see the normal container of the AquaVolta® Hydrogen Booster, which was filled with 0,2 l tap water (Munich) and 10 drops of the Reagent H2 Blue Kit ® were added. After operating 25 seconds, the solution discoloured and indicated the amount of dissolved hydrogen. In the operating level,(LED shines green), after 7 minutes the AquaVolta® Hydrogen Booster reached 1,7 ppm with the same tap water. This equates to an over saturation of 0,1 ppm. Testing the amount of molecular hydrogen is carried out immediately after production with the optional H2 Blue® Kit. A water sample of 6 ml is filled carefully into the measuring cup and one drop of the blue measuring liquid is added. Each drop that discolours means 0,1 ppm (=100 ppb) dissolved hydrogen gas. If a drop does not discolour automatically one can stir gently. If the liquid still does not discolour, then the last drop does not count. Water under normal air pressure can contain up to 1,6 ppm hydrogen gas (full saturation). 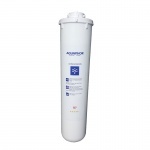 With the AquaVolta® Hydrogen Booster you can also produce an over saturated water with more than 6 ppm. Yet this falls back to full saturation after a few minutes when this water comes into contact with the normal atmosphere. Whoever wants a lot of hydrogen, has to drink quickly. First of all, one of the adapters has to be screwed into the unit, for both operating modes. 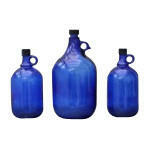 Its inner thread differs depending on the desired bottle size. When operating with the pressure container made of glass or plastic, it is screwed tightly to the adapter and filled with water from above. The most efficient hydrogen production results if you have no air bubbles in between the screw cap and water surface. To connect a water bottle, the device is fitted with the suitable adapter and held upside down. The bottle is screwed in upright and then the device is flipped over. Only use still water! No carbonic acid in the water. 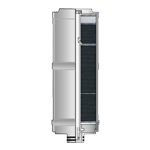 During production the AquaVolta® Hydrogen Booster has to be placed on a solid, flat ground. If the surface is too soft, the pressure valve on the bottom is not properly closed and the device is not working with enough pressure. With the On/Off button you start hydrogen production, something you can recognise with the fine, rising bubbles. By pressing the button once the LED shines blue and the device produces for 3 minutes. By pressing and holding the LED for 2 seconds the blue LED blinks and the device produces for 5 minutes. 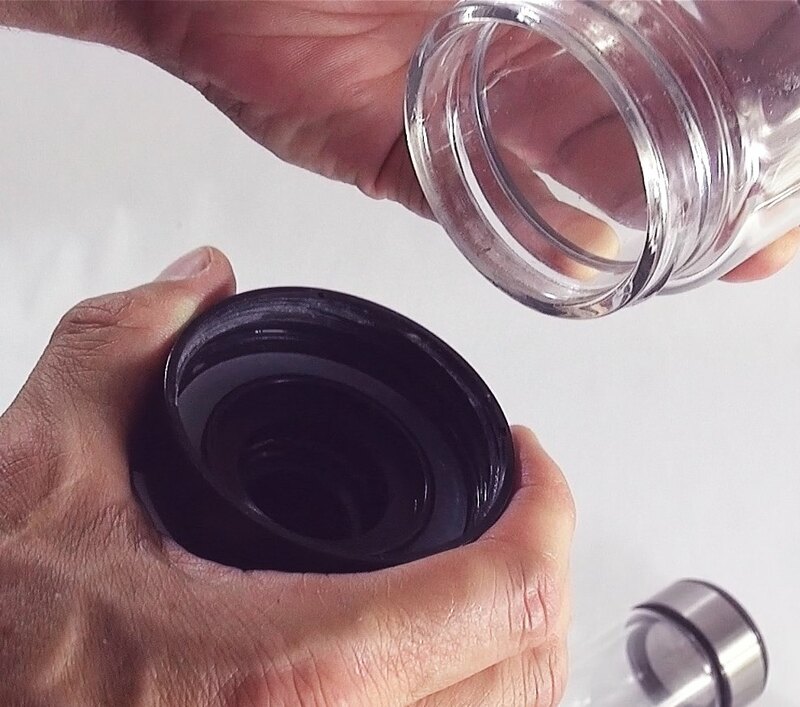 If you filled the container without any air bubbles, then it is predominantly hydrogen gas, which because of its pressure increases the solubility of the hydrogen in the water. The bigger the water container, the longer the electrolysis time should be. 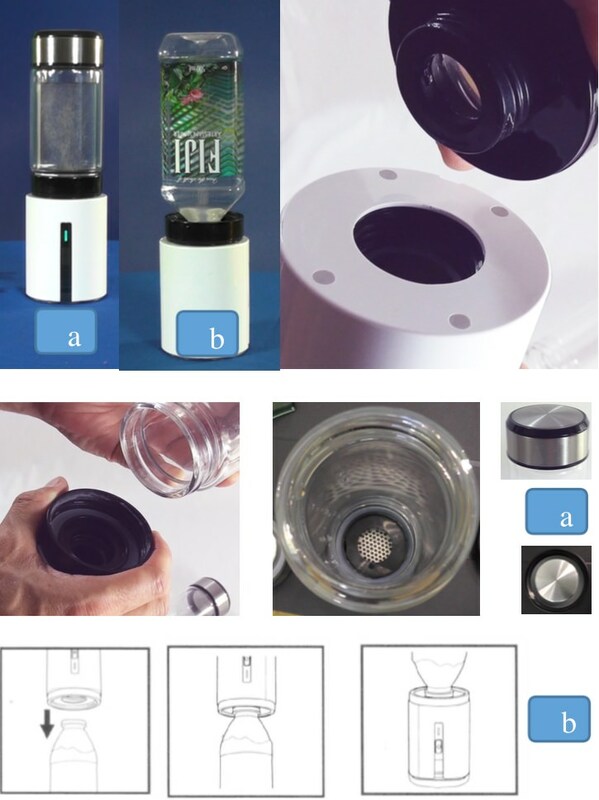 The small pressure container has a capacity of 0,2 Liter and produces in 5 minutes 0,8 ppm hydrogen content with reverse osmosis water (a). With VOLVIC (b) it needs 7 minutes to reach that. The pictured gas bubbles in a 1,25 l bottle of EVIAN mineral water shows the pressure build up after 7 (c) and 35 minutes (d). This produced a hydrogen content of 1,3 (c) and 5,9 ppm (d). 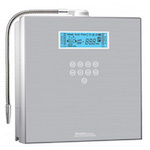 Hydrogen water | Best made with alkaline, already activated water from a water ionizer. 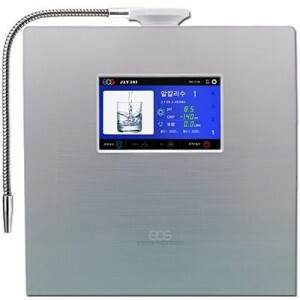 As opposed to alkaline activated water from a classic water ionizer, the pH value of the treated water remains the same. Hydrogen water can also be slightly acidic, although not as much hydrogen will be stored like with alkaline water. the ratio is 1,2 ppm to 1,9 ppm with the mineral water. Lay fruit, salads, cut flowers, raw eggs and vegetables in fresh, hydrogen rich, electrolysis water for 15-30 minutes. These refresh themselves by absorbing hydrogen, which is even absorbed through eggshells. With the absorption of hydrogen does the ORP of the foods sink, something the foods inspector Dr. Manfred Hoffmann regards as a sign of higher quality of nourishment. Mix milk powders, diet powders, fitness powders etc. with hydrogen water. Dissolve mineral and vitamin mixes with this water. Also like this the ORP sinks favourably thanks to the dissolved hydrogen. Buy juice concentrates – preferably organic. Like this you put an end to carrying the juice cartons and consequential pollution. No seller on the market can deliver juices with a better ORP. See: Asenbaum, K. H., Electro Activated Water, Munich 2016, page 42 ff. Mix alcoholic drinks and cocktails with hydrogen water. They become milder, the taste can be appreciated more. Make ice-cubes out of hydrogen water. After alcohol intake drink 2 glasses in the evening as well as 2 glasses the next morning on an empty stomach. Give your pets (dogs, cats …) hydrogen rich electrolysis water to drinkand observe how their fur and general health is positively improved. 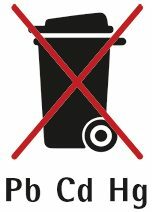 Batteries are not allowed to be disposed of with the household rubbish. As the end consumer you are legally obligated to dispose of used batteries according to the law. You are able to return batteries after use at your point of purchase or in your immediate vicinity (such as in communal collection points or at local retailers) without remuneration. Also you are able to return batteries to us per post. “Cd” stands for cadmium, “Pb” for lead and “Hg” for quicksilver. 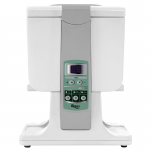 Related links to "AquaVolta® Hydrogen Booster | PEM Water Ionizer | Electric Water Ionizer"
Customer evaluation for "AquaVolta® Hydrogen Booster | PEM Water Ionizer | Electric Water Ionizer"